New York University Press, 9780814736982, 263pp. White by Law was published in 1996 to immense critical acclaim, and established Ian Haney L pez as one of the most exciting and talented young minds in the legal academy. The first book to fully explore the social and specifically legal construction of race, White by Law inspired a generation of critical race theorists and others interested in the intersection of race and law in American society. Today, it is used and cited widely by not only legal scholars but many others interested in race, ethnicity, culture, politics, gender, and similar socially fabricated facets of American society. 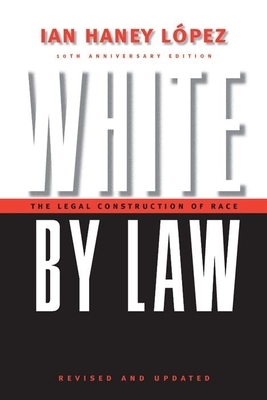 Ten years later, Haney L pez revisits the legal construction of race, and argues that current race law has spawned a troubling racial ideology that perpetuates inequality under a new guise: colorblind white dominance. In a new, original essay written specifically for the 10th anniversary edition, he explores this racial paradigm and explains how it contributes to a system of white racial privilege socially and legally defended by restrictive definitions of what counts as race and as racism, and what doesn't, in the eyes of the law. The book also includes a new preface, in which Haney Lopez considers how his own personal experiences with white racial privilege helped engender White by Law.